Mid-War Eastern Front is about to get its big release next month. Two books - 'Iron Cross' and 'Enemy at the Gates' - will have lists for 1942-era Germans and Soviets respectively. These will be followed up around Christmas by 'Ghost Panzers' and 'Red Banner', which will cover the respective nations' lists for 1943. While I'll likely be picking up the Stalingrad starter since it's a nice tank sampler, the rest of the units coming only has a handful of "gotta get that" entries in it. Enough to keep an eye on the calendar, but nothing like what the French are going to set me back in TY. While the armies are "eh" as I'm mostly into Late War, that new terrain is going to get really expensive for me. As nearly any gamer knows, "enough terrain" is a hypothetical concept that to date has not been achieved. Also actually interested in how the mat looks; desert/green grass didn't do much for me but city/steppe might work. Oh man, I can't wait to put hordes of Soviet infantry or Lend-Lease tanks on the table! In fairness, the French stuff for Team Yankee is all new for Battlefront. This is the first time that Battlefront has released those figures. The Mid-War stuff is only notable now when it's a kit that was previously released in resin and metal, and is now getting its first plastic release. I suspect that Battlefront could release some new Mid-War kits if it looked hard enough. But it would have to spend some time looking. Mid-War has been around in one form or another for a very long time now, and just about everything's been on the market for all that time. have BF said anything about changing the morale system for EF? I.e. do you still have 30-40 strong Soviet infantry units that are basically unbreakable? The standard infantry company (platoon equivalent) comes with 29 bases, and can be expanded to 36 with added support weapons. The save of the infantry teams in the unit is apparently 4+ instead of the usual 3+, so the teams should die faster (and be pretty easy to hit since they're MW Soviets). They also only have RoF 1. An alternate choice is the Hero infantry company. This represents a veteran infantry company, and saves on a 3+. However, their motivation is lower, and they are only allowed to take 11 stands of infantry (increased to 17 with the support weapon teams). Also, it's mention that Comissars no longer destroy a team to force a motivation reroll. Instead they provide a flat motivation bonus. The article is sparse on to hit numbers with one exception. The Storm Group (a group of hand-picked veterans that the Hero Company can take) is the only unit that is 4+ to hit. The others are all worse than that. 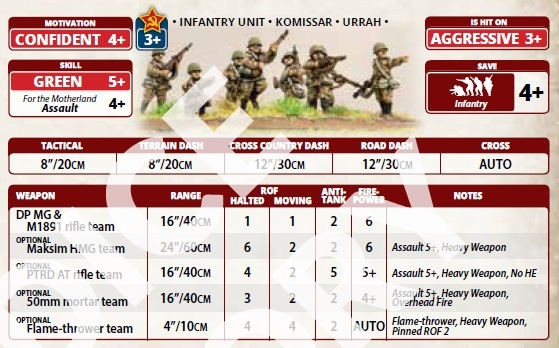 So you'll still have big Soviet units that are possibly even harder to route off the table (I'm guessing the morale rules aren't changed since there's no mention of them). But it's now easier to kill the infantry teams. There's more (including tanks) at the link. The article mentions that you can't quite get 21 T-34 tanks at 100 points. The 3+ moral is in effect as long as the Komissar team is active. That makes for a huge unit, but it'll be prime target for any artillery, and bleeding teams with every attack. I really like what they've done with the Soviet army. It's not just a 'shovel up your dead' horde any more. It doesn't do flexibility or react quickly to opportunity (big units and poor skill checks for special orders). It seems to me to be much closer to how the Soviet Army actually operated, dumb Kommissar rules aside (which are less dumb now, but still dumb). It's not all good though. They decided to strip out all the legacy (Barbarossa '41) armour from the game and the fudge to make Soviet infantry assault properly in the new rules is pretty poor. Soviet infantry isn't breaking and running until its so weak its departure in effect no longer matters. the specialist teams will all be picked off anyway, so just buy more teams. the 4+ save is an interesting choice, and I don't see a problem with it, yes artillery can murder them, it should, but you have more mobility than in V3, and with the specialists being less worth while you may as well run more bodies - looks like they will be better as just absorbing enemy fire while they get close, then assault from one direction to roll up. Personally think they have so missed a trick, run the platoons individually - but only the company commander counts as a unit commander - so they have to bunch up or a lot less effective, but now you can break them in stages and they are no longer assault steam rollers. meh, overall not that impressed with V4 anyway, was hoping the MW Eastern Front books would change a few things, they haven't, its still TY 1940's, TY feels about right for the 1980's but for the 1940's it simply doesn't. Pity, used to play this a lot, hardly bothered since V4, just don't enjoy it. It appears they have tried to do something different to avoid the "dumb hordes you remove with a shovel" syndrome, but the way these guys interact with the core rules simply means large units are a problem. dashing 12" a turn, and frankly until close enough to assault why wouldn't you? means you will be in your opponents face faster than under V3, you lose some weapons fire.. big deal, frankly if I could shave a few points and take the rifles off them I would anyway for how useful they are. I think that Mid war is always the hardest era to balance, you have german Panzer 3’s fighting Stuart’s in the desert on the one hand and panthers fighting KV’s in the east - balance will always be hard. Solution to that though is actually both pretty simple and pretty obvious - make them separate theatres, and make it clear there is no attempt at balancing them against each other.